The market is broken. The price of housing is through the roof. Social housing is neglected. In major cities around the globe ordinary people can no longer afford to buy or rent basic accommodation. Incomes stagnate while the gap between the 1 per cent and the rest of us widens. Housing insecurity and homelessness are the inevitable result. Families find refuge in temporary shelters or with relatives; young people couch surf; the addicted and the mentally disturbed drift to the street. Treating housing as a commodity rather than a human right leaves people homeless and hurting. This needs to change. 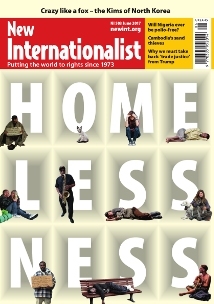 This edition of New Internationalist looks at how to prevent homelessness and outlines the steps to a world where everyone is safely housed.